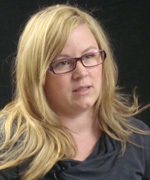 Kelly Davies began working in The Peak creative services department as a 15-year-old high school student. When her high school work experience ended, she “hung around” and negotiated with her teachers to continue to come to the office on Tuesdays. Davies left Powell River to attend post-secondary studies in Victoria, where she subsequently worked at Monday Magazine, an arts and entertainment weekly owned by Black Press Ltd. When she returned to Powell River, she accepted a front office position at The Peak until a position opened up again in creative services. According the PRPeak website, Davies serves as Creative Services Director, responsible for producing two publications a week, many special supplements throughout the year and Discover Powell River, an annual tourism magazine. Kelly Davies, creative services director, The Powell River Peak, explains how she got a job at The Peak and her role at the newspaper in her current position. Kelly Davies, creative services director, The Powell River Peak, tells what is needed to prepare for a job like hers and how The Peak contributes to its community.